Mitsubishi raced to an impressive 1-2 finish in the Electric Vehicle division of the 2014 Pikes Peak International Hill Climb. 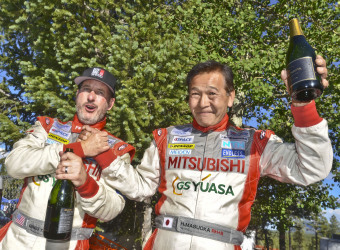 Six-time PPIHC motorcycle champion Greg Tracy and two-time Dakar Rally winner Hiroshi Masuoka took their MiEV Evolution III all-electric prototype racecars to the finish line before any other competitor, with Tracy finishing a mere 2.4 seconds behind the overall 2014 Pikes Peak winner and his gas-powered Le Mans sports car prototype. 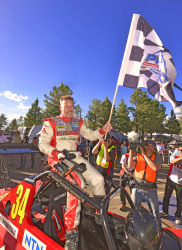 In addition to setting a new record in the Electric Vehicle division by completing the climb in only 9 minutes and 8.188 seconds, Tracy became Pike Peak’s first participant to record a sub-10 minute lap time in both two-wheel and four-wheel racing categories.